Cooking dishes like these at home, have made me appreciate food a whole lot more... they seem so simple, but are filled with beauty and flavor! I tweaked the recipe a little by adding extra sharp white cheddar cheese and nutmeg. Preheated the oven to 375 degrees. Started cutting my potatoes into 1/8 inch thin (using my Japanese plastic mandolin). In a small pot, combined and heated the cream, milk, garlic, nutmeg, rosemary and thyme. When it began to boil...turned down the heat. Let the herbs steep in it for five minutes. At the pot I removed the herbs, and added the cheddar little by little while stirring the whole batch... (almost like making a fondue). 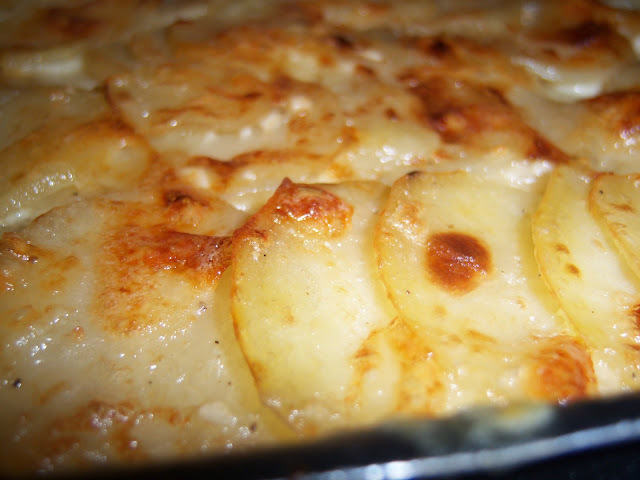 Then poured a couple of chef spoons worth of the sauce over the first layer of potatoes...carefully spread the sauce with my wooden spoon, and began shingling my second layers of potatoes, and repeated the process until I did my last layer. Poured the rest of the milk mixture over my potatoes and carefully spread evenly. Than shaved 2 tbsp worth of cheese over the top. Baked the whole dish (covered in aluminum foil) in my oven for about 45 minutes. Uncovered the dish and baked 5 minutes in the broiler until golden brown. Let it rest on the stove top for another 5 minutes... so that the milk and cheese can set. Then I served with the Rosemary Garlic Roasted Chicken I did... it paired so well, it was delicious! I like your site and especially your directions, so clear. Nutmeg is so good with creamy dishes and I use it often, why have I never thought of this?! Sounds great.